Artist Palette Cheese Tray (1 tray) This unique ceramic cheese tray will make any gathering one to remember. Impress your guests with this fun and versatile cheese tray that will beautifully display any tasty delectable. Go ahead, paint the town vermilion...and cobalt, and cadmium, and crimson, and ochre! Dishwasher and microwave safe. 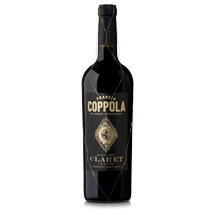 Dimensions: 15 1/4"L x 12"W.
Francis Coppola Reserve Syrah (1 bottle) Dark succulent flavors of cherries and black plums follow, with elevated spice nuances on the toasted wood, mocha-tinged finish. This is a vintage from which you’ll want extra bottles to cellar. 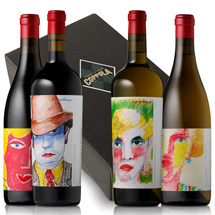 Francis Coppola Reserve Chardonnay (1 bottle) Discover an intensely fragrant and rich Chardonnay that offers a good measure of natural acidity to keep the structure in tact. 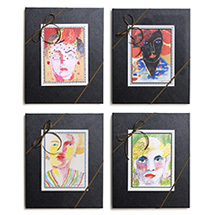 Guava, tangerine, and pineapple impressions mingle with notes of orange blossoms, cloves, and crème brulee. Silky in the mouth and long on the finish. 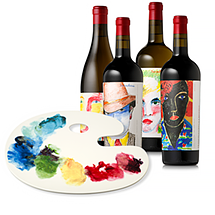 Francis Coppola Reserve Viognier (1 bottle) Our Viognier leans more towards tropical fruit tones, fragrant notes of jasmine, and just a trace of limestone minerals. Leading with a beautiful perfume of lychee, apricot, and island flowers, this wine offers juicy, mouth-filling flavors of pineapple, citrus, and melon, all perfectly balanced by vibrant natural acidity.